In 1902 Rudolf Steiner becomes General Secretary of the Theosophical Society in Germany, where he finds people interested in his aim of shaping culture and society through spiritual practice. Development of the Theosophical Society in German-speaking regions, broad international lecture activity, fundamental books on anthroposophy. The Anthroposophical Society is founded on December 28, 1912 in Cologne, Germany, with about 3000 members. Many artistic activities: summer festival weeks with performances of “mystery plays.” During World War I a building called the Goetheanum is erected in Dornach near Basel, Switzerland, with the help of artists and helpers from all European countries. Proposals for “trisectoring the social organism” are offered to post-war Germany. The first Waldorf school is founded in Stuttgart, Germany in 1919. Fundamental ideas are formulated for extending the practice of medicine through anthroposophy. The Goetheanum is destroyed by arson on New Year’s Eve, 1922/23. The international growth of the Anthroposophical Society makes restructuring necessary. Fifteen countries have Anthroposophical Societies. Refounding of the Anthroposophical Society at Christmas 1923. A School of Spiritual Science is established by Rudolf Steiner. It has sections for general anthroposophy, education, medicine, mathematics, science, etc. 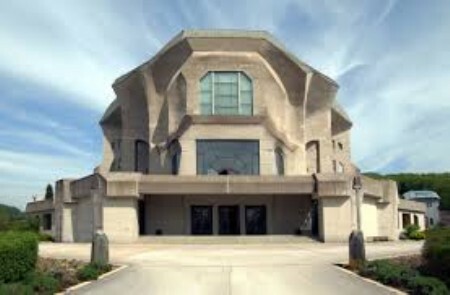 A decision is made to rebuild the Goetheanum as a center. Foundations are laid for biodynamic agriculture and anthroposophically-inspired curative education. Rudolf Steiner dies on March 30, 1925. Swiss poet Albert Steffen becomes president of the Anthroposophical Society. The restructuring that had been started remains fragmented. Various initiatives are continued worldwide. 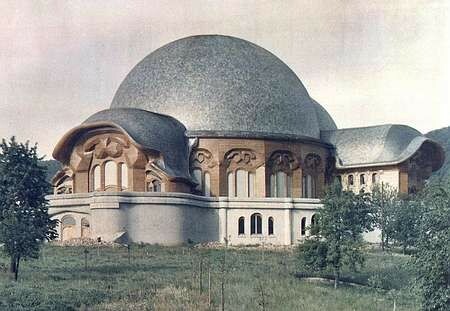 The second Goetheanum opens in fall 1928. The National Socialists in Germany ban the Anthroposophical Society there, which is by far the largest group. Parts of the anthroposophical movement continue their work independently of the Anthroposophical Society after internal disagreement. Marie Steiner stages the world premiere of Goethe’s Faust I and II (unabridged) in 1932. Activities are greatly restricted by the war. Intensive groundwork, development and institutionalization. Rudolf Steiner centers are developed in major cities around the world. Local groups (“branches”) study basic anthroposophy and provide forums for initiatives, such as seminars and training centers in Waldorf education, agriculture, curative education, art, etc. Principles of anthroposophically extended banking are developed. Change in generations. Anthroposophically extended medicine, education, curative education and agriculture spread around the world as society in general changes. Schools, farms, homes and training centers are established in all parts of the world. Cultural initiatives are started in social focal points in South Africa, South America, prison programs, treatment of addiction, etc. Regional and international conferences. The questions raised at the beginning of the 20th century within the anthroposophical context have become the basic problems of the civilized world today. A partial integration of anthroposophical approaches is beginning to show in the cultural life of the western world. For the development of the School of Spiritual Science, emphasis is placed on the founding impulses of the General Anthroposophical Society. Today the Anthroposophical Society has 52,000 members, with societies in 50 countries. About 10,000 institutions around the world work on the basis of anthroposophy. School of Spiritual Science The General Anthroposophical Section is both the starting point and the center of the School of Spiritual Science. Here a foundation is laid step by step for all branches of spiritual research. The three core subjects are: anthroposophical study of the human being; evolution and history of humanity; and the science of initiation. These fields cover the broad outlines of Anthroposophy. In 1924 Rudolf Steiner developed a course of study based on meditative exercises that lead «the spiritual in the human being to the spiritual in the universe.» This is the basis for the work of the School of Spiritual Science. It is also the background of the research, teaching, and training activities of the General Anthroposophical Section. The work of the Section for Mathematics and Astronomy includes qualitative investigations into measure, number and weight, studies on the morphology of the starry sky and its constellations, cosmological study of man and rhythm research. Particular importance is attached to projective geometry as the foundation of a new morphology and physics. Research on correspondences between the macrocosm and microcosm and on the place of the human being in this context draw the Section into close collaboration with the pedagogical, medical and agricultural fields. The Medical Section devotes itself to medical and pharmaceutical research as well as to training and continuing education of physicians, pharmacists and therapists. Faced with the pathogenic aspects of modern life, it supports «culturally therapeutic» causes, methodological plurality in scientific discourse, patient’s right to choose, and the legal battle for complementary medicine. In its collaborative work with the artistic and scientific sections, two core questions of anthroposophical medicine are central: How does health arise? What is the nature of disease and healing? By the beginning of the twentieth century, science – ecology, biology, physics, chemistry – began hitting its own limits. The task of the Natural Science Section is to push beyond these limits, to explore further, to set out from new premises leading to new results and capacities. The foundation for its work is the scientific method developed by Goethe and further developed by Steiner. The key question: Can we, by honoring the appearances of the phenomena, reach a scientific understanding that is true to the living world, its supersensible dimensions and its specific life connections? In the Section for Agriculture the focus is on research, collaboration and public representation in the areas of soil management, crop cultivation, animal husbandry and the farm organism. Knowing and working with planetary-earthly correspondences is basic to the bio-dynamic method of agriculture as practised worldwide. These experiences lead to social and economic perspectives, to insights and practical implications for market structuring and to associative activity on regional, national and international levels. For the Pedagogical Section, education is the foundation of social progress. The seeds of selfdetermination, tolerance and peace, human rights and international understanding are sown in education. This is the art of Waldorf pedagogy. The chief task of the Pedagogical Section is pedagogical research and development based on the anthroposophical image of the human being. The Section supports ideas and initiatives to address the generational problems and the changing needs it perceives in children. The Section for the Spiritual Striving of Youth sees its purpose more in connecting and advising than in research and teaching. It is a vibrant hub, a place of meeting, exchange and stimulation. At the same time it is a place to explore new initiatives and find ways to realize them. The essential aim of the Section is future-oriented: to support young people in their spiritual striving, their need to understand the world and their urge to be active. The Section for Social Sciences is concerned with human relationships in the three spheres of social life: economic, legal and cultural/spiritual. Depending on the sphere different fundamental questions arise: How are the basic needs of the world's population to be met? What responsibility does a good citizen bear for the common good? What does a human being need from the world in order to reach his or her potential? With such questions in mind the Section conducts research, pursuing insight and creative forms in a range of areas including: family culture, biography work, conflict resolution/peace studies, addiction, economic questions and the science, practice and politics of law. The Section for the Arts of Eurythmy, Speech, Drama and Music integrates these arts, bringing them to life on stage and working in concert with other sections to develop their pedagogical and therapeutic potential. Based on a spiritual-scientific image of man, its aim is to make visible the complete human being, giving expression to supersensible forces and inherent laws that form the human constitution. Like other sections, the Section for Eurythmy, Speech, Drama and Music is a training center engaged in teaching and research. The Art Section embraces painting, sculpture and architecture, furniture design, glass engraving, color studies and plant-color research. Art therapy and art education are also included through inter-sectional work. The process of cultivating Rudolf Steiner's artistic ideas and developing them further leads to creative working relationships, international exhibitions and events, lectures, colloquia and courses on artistic topics. It guides the artistic work on the Goetheanum itself, the neighboring buildings and landscape. The work of the Section for the Literary Arts and Humanities is captured by its motto: «In thought, develop sight.» Its aim: to cultivate and deepen the humanities through Anthroposophy. Literature and linguistics, aesthetics, history, philosophy, the history of music and art history are within its purview. Central to its work are literature and poetry, linguistic explorations and the cultivation of language itself, for language is the living link between content and form. The Section sees its task related to bridging the gap between art and science.